Visit Crime Stoppers online to view wanted criminals and report tips. Crime Stoppers of Houston is Houston’s leading public safety non-profit organization dedicated to keeping you safe where you live, learn work and play. 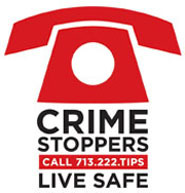 Through its famed anonymous tip line 713-222-TIPS, Crime Stoppers of Houston has solved over 30,000 crimes, arrested over 25,000 felony fugitives and paid over $10,000,000 in cash rewards. Known world over as a leader in crime prevention, Crime Stoppers of Houston invests in the tools, programs and technologies to prevent crime before it occurs. Join Crime Stoppers in keeping Houston safe for future generations!